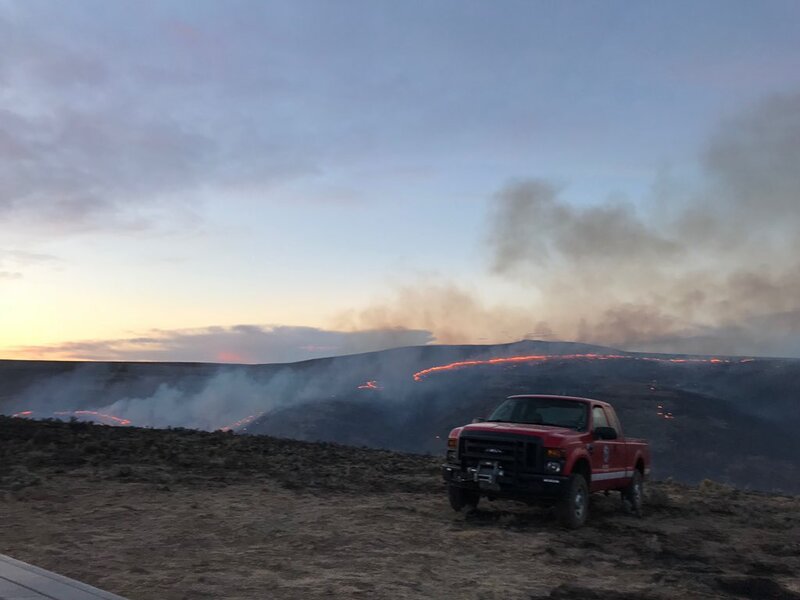 VANTAGE, Wash. – Fire resources were sent to a brush fire around 1717 hours on Wednesday, June 20, 2018, located near Vantage, Washington when it was only five acres in size. The original fire assets were H-1MR H-343 SE-461 SE-463 SEWELL SE-SLYFIEL dispatched through the Central Washington Interagency Dispatch Center. 1209 hours | Containment has reached a 100% status with DNR resuming command at 1200 hours. The fire consumed a total of 7,614 acres. Resources will be continuing to patrol the fire perimeter. 1819 hours | Fire crews have reached a 89% containment status. 7,280 acres have been destroyed. Crews will work to gain their objective of a fully contained (100%) throughout the night with continued patrolling and mopping up. 0054 hours | Fire mobilization (or Fire MOBE) is approved by the Washington State Patrol HQ Office. Located in Kittitas County. 2,000 acres in size. 30 homes are under direct threat. Level evacuations in place. 0556 hours | Type 3 IMT is on order. Fire has consumed 1,750 acres. 0736 hours | Fire is burning in Central Washington near the Columbia River and approximately 19 miles east of Ellensburg. 0905 hours | Fire has grown to an estimated 4,000 – 5,000 acres. 5% containment. More firefighters are arriving today, including the SE WA IMT team. 1000 hours | Fire mobe resources arriving throughout the day. 1728 hours | Fire has burned up to 5,000 acres and crews have successfully reached a 30% containment status. 1900 hours | Vantage Highway is open but heading West, the bright sun and smoke in the area are reason to caution yourself when driving through the area. 1930 hours | Washington Department of Natural Resources or WA DNR were called and they dispatched out additional resources, including engines and two helicopters. The fire was estimated to be at well established at 100 ares and growing. Vantage Highway closed due to down power lines. Fire located west of Vantage. 2143 hours | DNR sent additional resources including three planes, a single 20-person Ahtanum hand crews which would be later be tasked with performing burnout operations. Dry grass fire conditions. Fire estimated at 800-1000 acres with a high rate of spread. 2345 hours | SE WA IMT team is assigned to incident.